Four people, including Bassem Tamimi, the head of the Popular Committee of Nabi Saleh, were arrested by Israeli police today as Palestinians staged a peaceful direct action in an Israeli supermarket near the illegal settlement of Shaar Binyamin, north of Ramallah, calling for a boycott of Israeli goods. Two Palestinians were injured and removed in ambulances. Before he was arrested, Tamimi’s ribs were reportedly broken. Two of those arrested were international human rights activists. One is an American and the other is from Poland. 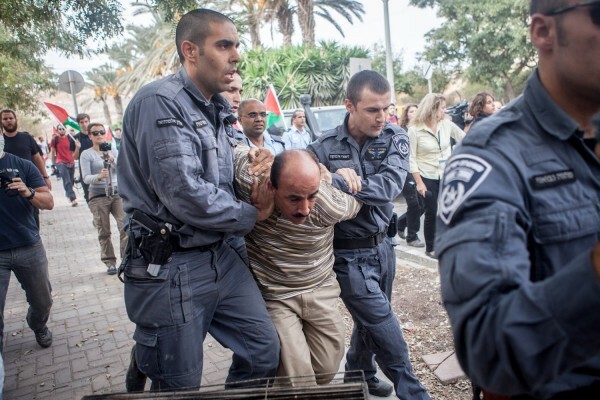 The American activist was dragged away by four Israeli officers. Starting at around ten this morning, Palestinians and international activists gathered in the parking lot of Rami Levi supermarket, which is frequented by Israelis from the surrounding illegal settlements. The activists entered the market and walked up and down the aisles, holding Boycott, Divestment, Sanctions (BDS) placards and waving Palestinian flags. Demonstrators left the market voluntarily when the Israeli army arrived on the scene. As activists exited the building, about forty police, border police and soldiers were waiting in the parking lot. There, the Israeli authorities attacked the demonstrators and fired sound bombs at them. Even though the demonstrators remained non-violent, soldiers punched, dragged and choked them. 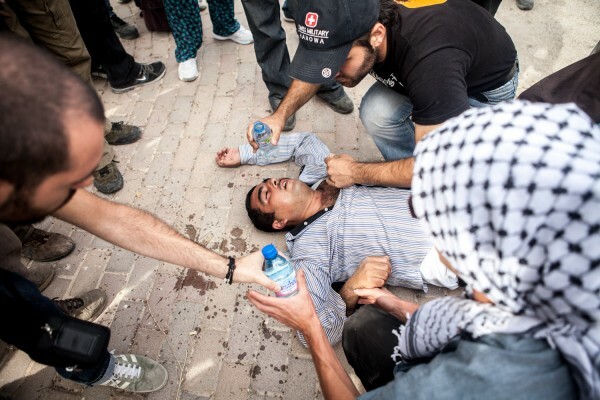 As one Palestinian man was pulled away from the soldiers by other demonstrators, to prevent his arrest, his walking stick was taken away as he lay on the ground – following this, he could not walk without assistance. A sound bomb was thrown just metres from the head of another Palestinian man who was already unconscious following attacks from the authorities. Bassem Tamimi is the head of the popular committee of Nabi Saleh, a village that has suffered drastically from the creation and expansion of illegal settlements in the West Bank. Halamish settlement was created less than 1km away from Nabi Saleh, stealing a great deal of the villages’ land, as well as a spring that provided a vital water source for the village. Tamimi was released from prison in April of this year after spending 13 months in an Israeli prison for being accused of “taking part in illegal gatherings.” He was released on bail in April in order to take care of his elderly mother who had suffered a stroke. The action today aimed to highlight the BDS campaign (www.bdsmovement.net ), which calls for a boycott of Israeli goods. The status of the detained demonstrators is currently unknown, they remain held in the police station of the illegal settlement of Shaar Binyamin. 40 days after the killing of protester Mustafa Tamimi in Nabi Saleh, the village holds a march of commemoration. The army in response continues to shoot tear-gas canisters directly at protesters, against its own open-fire regulations. A medic was injured by two canisters shot directly at him. Six weeks after the killing of Mustafa Tamimi by a tear-gas canister shot directly at him from close range, the village devotes weekly protest to his commemoration. The village of Nabi Saleh has been protesting for the past two years against the appropriation of the village’s spring by the neighboring settlement of Halamish. This week, protesters decided to march towards the village hilltops, overlooking the spring. Already as they were climbing the first hilltop, the peaceful demonstrators were met by a volley of tear-gas canisters. However, as wind carried most of the tear-gas back towards the soldiers, protesters were able to continue marching towards the adjacent village of Dir Nidham, which lands have also been taken over by Halamish settlers. At this stage Israeli soldiers managed to climb up the next hilltop, which put them in a position to shoot tear-gas canisters directly at protesters. This manner of targeted shooting is in complete breach of the army’s own open fire regulations and already caused the death and injury of several protesters, including Mustafa Tamimi. One medic was injured during this assault after two consecutive tear-gas canisters hit him in the thigh. He was evacuated by fellow medics, who rushed to help him and carried him back towards the village. Soon after this, other demonstrators also made their way back to the village, but even then the Israeli soldiers continued shooting large amounts of tear-gas at them. Tear gas was also shot in the village’s populated areas, including into houses, as the soldiers entered the village. Several youth threw stones at the army jeeps to ward off this incursion. The demonstration was maintained for a few hours, with the army occasionally using the “skunk”, a water cannon spraying foul-smelling liquid, rubber coated bullets and a appliance which launches dozens of tear-gas canisters simultaneously. RAMALLAH (Ma’an) — Israeli forces raided Nabi Saleh village in the central West Bank early Friday, detaining three Palestinians, officials and residents said. Dozens of soldiers closed the entrance to the village, declaring it a closed military zone, and raided several houses using police dogs, witnesses told Ma’an. The forces damaged a number of homes and harmed residents in the raids, locals told Ma’an. Nabi Saleh, northwest of Ramallah, hosts weekly protests against land confiscation for an illegal settlement, and Israel has cracked down on its residents, carrying out night raids and arresting accused stone-throwers. The villages’ popular resistance committee said the overnight raid shows Israel cannot face the peaceful popular protests in Nabi Saleh. In early 2011, Israeli forces photographed all the children in Nabi Saleh during night raids on homes, an operation captured on film by a resident working for the Israeli peace organization B’Tselem. Many minors were later arrested in the village. After Israeli armed forces opened fire directly at him and fellow journalists, photojournalist Mati Milstein filed complaints with the Israeli authorities responsible. After a five month delay, the IDF Spokesperson responds: ignoring the evidence, defending the IDF for opening fire, disparaging the journalistic relevance of covering Nabi Saleh protests, and insisting journalists on the scene are there at their own risk. Nearly five months ago, on July 29, Israeli reserve infantrymen and Border Police officers opened fire on a group of photojournalists and television cameramen during a non-violent protest in the West Bank village of Nabi Saleh. Troops from the Alexandroni Brigade then – totally unprovoked – arbitrarily threatened me and fellow press photographers with arrest. Days later, I filed a formal complaint with the Israel Defense Forces, the Israeli Border Police and the Israeli Government Press Office, with all relevant details required for an investigation of the attack. The GPO kindly forwarded my complaint – adding a cover letter from GPO Director Oren Helman requesting a timely examination of and response to my claims – to key officials in the Border Police and the IDF, as well as to the Foreign Press Association. The Border Police ignored the query entirely. The IDF Spokesperson Unit failed to acknowledge receipt of both my original complaint and the GPO’s subsequent request for a response. However, via periodic telephone queries to the IDF Spokesperson, I was made to understand that the incident was under investigation and that – due to its complex nature and the multiple military units involved – this investigation would take time. I was assured that at its conclusion I would receive a formal response. Five months passed. Only in the final week of 2011 did I finally receive a formal response from the Israeli army. With excited anticipation, I opened the response from Lieutenant Colonel Avital Leibovich, of the IDF Spokesperson Unit’s North America Desk. Leibovich’s letter was a general – and quite inaccurate – proclamation purportedly describing the “violent and illegal demonstrations” and consistent rock-throwing attacks faced by Israeli soldiers in Nabi Saleh. In a blatant show of disrespect of the very media she is meant to be assisting, Leibovich ignored the details of the July 29 incident, which I had so meticulously provided to her. She instead unilaterally justified the use of force and violence by Israeli security forces against both protesters and media personnel. Given that Leibovich’s letter made no reference whatsoever to an investigation, it seems clear that the army never did carry out any examination of the violence and threats against members of the media. Clearly, conflict photographers face certain risks when carrying out their professional duties – indeed, they are sometimes caught in the eye of the storm – and they consciously accept these risks. Photojournalists, who must be physically close to their subjects, knowingly place themselves in the crossfire. My colleagues and I – Israeli, Palestinian and foreign – have in the past been inadvertently hurt while covering such events, hit by rocks, rubber bullets and tear gas grenades. This is, simply put, part and parcel of the job. No one complains. Leibovich fails to understand a critical distinction: There is a fundamental difference between: 1) journalists voluntarily placing themselves in areas where, during the course of their work, they might face potential and inadvertent harm; and 2) soldiers voluntarily opening fire on a group of clearly-marked journalists, even when no protesters or other perceived threats are located in the vicinity of said journalists. Lieutenant Colonel Leibovich, with all due respect, did you really think no one would notice if you abdicated your responsibilities and ignored both a legitimate complaint filed by an accredited member of the Israeli press corps, as well as the Israeli GPO’s own request for a proper investigation of the attack? Rather than carrying out your duties, you exploited the circumstances of an unforgivable violent attack on the media to further propagate a propaganda that ignores all – very verifiable – facts on the ground. Meanwhile, the protests in Nabi Saleh continue, as does the press coverage of these protests, despite Leibovich’s firm belief that this coverage has no journalistic value. The soldiers of the Alexandroni Brigade have long since returned home, but Israeli military units subsequently deployed to Nabi Saleh continue to open fire on both non-violent protestors and members of the media, making illegal use of the weapons at their disposal. In the interceding five months, one man was killed in the village and numerous individuals have been wounded seriously enough to require hospitalization. Leibovich failed completely to respond to my charge of an Israeli military attack on press freedom and, furthermore, has provided tacit systemic approval for future direct, tactically-unjustified – and potentially deadly – attacks on journalists. No lessons have been learned here. The blood – when it comes again, as it surely will – will also be on your hands, Lieutenant Colonel Avital Leibovich. Mati Milstein’s photography and writing have appeared in Haaretz, The Jerusalem Post, Bild, Le Monde, Monocle, Daily Mirror, National Geographic News, The Forward and other publications. Two weeks after the killing of Mustafa Tamimi during a demonstration in the village, an Israeli sniper shot a protester with live 0.22″ caliber ammunition, banned for crowd control purposes. Earlier today, an Israeli military sniper opened fire at demonstrators in the village of Nabi Saleh, injuring one in the thigh. The wounded protester was evacuated by a Red Crescent ambulance to the Salfit hospital. The incident takes place only two weeks after the fatal shooting of Mustafa Tamimi at the very same spot. Additionally, a Palestinian journalist was injured in his leg by a tear-gas projectile shot directly at him, and two Israeli protesters were arrested. The protester was hit by 0.22″ caliber munitions, which military regulations forbid using in the dispersal of demonstrations. Late in 2001, Judge Advocate General, Menachem Finkelstein, reclassified 0.22” munitions as live ammunition, and specifically forbade its use as a crowd control means. The reclassification was decided upon following numerous deaths of Palestinian demonstrators, mostly children. Aqel Sror, age 35, was killed on 5 June 2009, in Ni’lin. Contrary to the army’s official position, permissive use of 0.22” munitions against demonstrators continues in non life-threatening situations. Late in 2009, settlers began gradually taking over Ein al-Qaws (the Bow Spring), which rests on lands belonging to Bashir Tamimi, the head of the Nabi Saleh village council. The settlers, abetted by the army, erected a shed over the spring, renamed it Maayan Meir, after a late settler, and began driving away Palestinians who came to use the spring by force – at times throwing stones or even pointing guns at them, threatening to shoot. While residents of Nabi Saleh have already endured decades of continuous land grab and expulsion to allow for the ever continuing expansion of the Halamish settlement, the takeover of the spring served as the last straw that lead to the beginning of the village’s grassroots protest campaign of weekly demonstrations in demand for the return of their lands. In order to prevent the villagers and their supporters from exercising their fundamental right to demonstrate and march to their lands, soldiers regularly use disproportional force against the unarmed protesters. The means utilized by the army to hinder demonstrations include, but are not limited to, the use of tear-gas projectiles, banned high-velocity tear-gas projectiles, rubber-coated bullets and, at times, even live ammunition. The use of such practices have already caused countless injuries, several of them serious, including those of children – the most serious of which is that of 14 year-old Ehab Barghouthi, who was shot in the head with a rubber-coated bullet from short range on March 5th, 2010 and laid comatose in the hospital for three weeks. Mohammed Khatib is a leader of the Bil’in Popular Committee Against the Wall. He was arrest on Friday 16 December, along with Mohammed Tamimi from Nabi Saleh and 21 other Palestinian, Israeli and International activists when the Israeli Occupation Forces attack mourners at the conclusion of Mustafa Tamimi funeral. At the conclusion of the funeral, mourners marched peacefully to Nabi Saleh land and were attack with teargas, rubber bullets and skunk by the Israeli military. The following statement was issued by Mohammed Khatib on his release from prison. 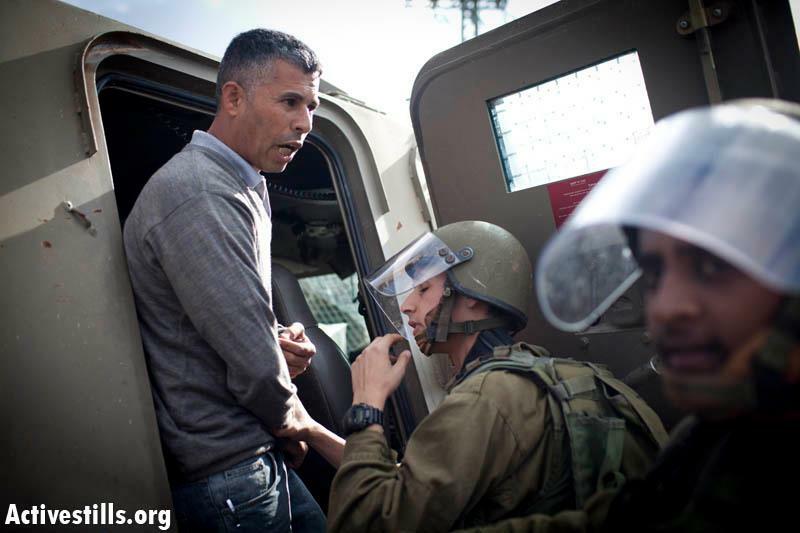 Mohammed Tamimi remains in prison. Also in prison is Ayala Shani, an Israeli activist, who refused release from prison, instead remaining in prison in solidarity with Mohammed Khatib and Mohammed Tamimi. I have just been released from jail, after three days inside. I was arrested last Friday, together with 22 others, in the village of Nabi Saleh, during a demonstration commemorating the murder of Mustafa Tamimi. Our arrest took place as we peacefully protested near the entrance to the Jewish-only settlement of Halamish, which is built on lands stolen from Nabi Saleh. Minutes after we got to the gate, Israeli Border Police officers moved in to remove us from the scene. Palestinians, Israeli and international activists, we were all shackled and dragged away into military jeeps that transported us to the adjacent military base, which is in fact part of the settlement. In the military base, still shackled, I was assaulted by a settler who hit me in the face, leaving me with a bloody nose. Shortly after, the settler also attacked a female Israeli activist who was by my side. The soldiers and policemen present did not prevent the attack, nor did they bother to detain the settler after the fact. Instead, the zip-tie locks on my hands were removed, only for my arms to be bound again, this time behind my back. Hours later, at the police station, I learned that to cover up their responsibility for my attack, the soldiers have laid a bogus complaint against me for assaulting them. My hands were tied, my face was bleeding, but it was I who spent the night in the inside of prison cell. 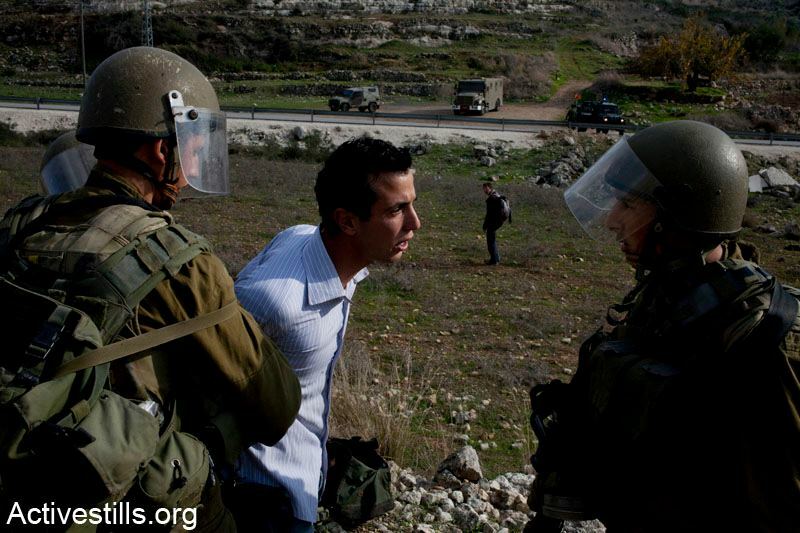 Mohammed Tamimi from Nabi Saleh was also arrested during that same demonstration. While the police decided to release all the others, he and I were to remain in jail. During our demonstrations, soldiers often take pictures, to later use them as “incriminating evidence”. This time, the soldiers used one such picture to accuse Mohammed of throwing stones during a demonstration a few weeks or months back. The man pictured in that photograph is not Mohammed Tamimi from Nabi Saleh, regardless, he remains in jail. Military law allows Israel to keep us Palestinians in jail for eight days before seeing a judge, and even then, it is a soldier in uniform who is the so called neutral arbitrator. As the prison doors closed behind me, my happiness was clouded by the fact that Mohammed Tamimi was not released. The battle for his freedom is only beginning, as our lawyers prepare the petition for his release. If you can, please help us fund legal aid for him and for the countless others who are regularly arrested protesting Israeli Occupation. I would also like to use this letter to extend my gratitude to Ayala Shani, an Israeli comrade who was arrested with me. She refused the injustice of being released while both me and Mohammed Tamimi were still detained. As these words are written, she is still in jail, despite having been offered her freedom twice already by Israeli courts.